Two people have died after a light aircraft crashed in County Antrim. The small plane, thought to be a Cessna, came down between Nutts Corner and Loanends at about 12:20 BST on Thursday. An eyewitness told the BBC it circled over houses and tried to land, before crashing in a field and catching fire. Police said the crash site would be cordoned off for "some time" to maintain "the integrity of the scene" for the Air Accidents Investigation Branch. The NI Ambulance Service (NIAS) put major incident protocols into action, but the incident was stood down at 12:49 BST. The area around the the crash site is still closed off as the investigation continues. Ballyhill Lane, near Crumlin, is closed to traffic. Investigators are at the crash scene trying to work out what went wrong. Flying conditions on Thursday were near perfect, and Friday's weather is good again, meaning the crash site has been preserved overnight. 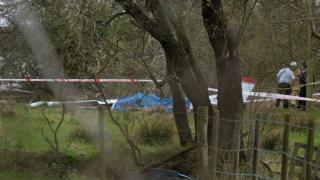 There are reports the light aircraft was on a round trip from Ards Airport when it crashed at about 12:30 on Thursday. On Friday, Ards Flying Club said it was not able to comment and directed all media inquiries to the police. The two victims of the crash have yet to be named. Three fire engines and the police also attended the scene. Roy Divers lives nearby and watched the plane come down. "The angle of it, it was on its side heading towards the ground," he said. "You knew it was going to crash. "There was no immediate explosion, which baffled me for a wee bit. I thought maybe I was mistaken, then when I saw the smoke I realised what it was." Mr Divers said he tried to contact the emergency services but could not get through. "I just jumped into the car and drove round," he said. "I got into the field with the view of trying to get the pilot out but it was on fire." The DUP MP for South Antrim, Paul Girvan, extended his sympathies to the families of those killed and paid tribute to the members of the public who tried to help at the scene. "My thoughts go out to those people who have witnessed such a tragic event," he said. "We have to thank them for their prompt action in going to the scene of the accident and trying to do what they could to help those who were trapped inside the aircraft." Nutts Corner is just a mile from Belfast International Airport but officials said the plane was not going into or out of the airport. Belfast International Airport remains open with flights operating as normal. Sinn Féin MLA Declan Kearney extended his condolences to the families of those killed. "Whatever the cause of the crash, it is appears that those on board tried their best to land the aircraft safely, and away from populated areas," he said. He commended local people for their "quick response and their efforts to assist in such harrowing circumstances".